Ok, enough with the games vein… now let’s go to the orange trees field and work a little collecting some fruits, at least enough to fill a wooden box. 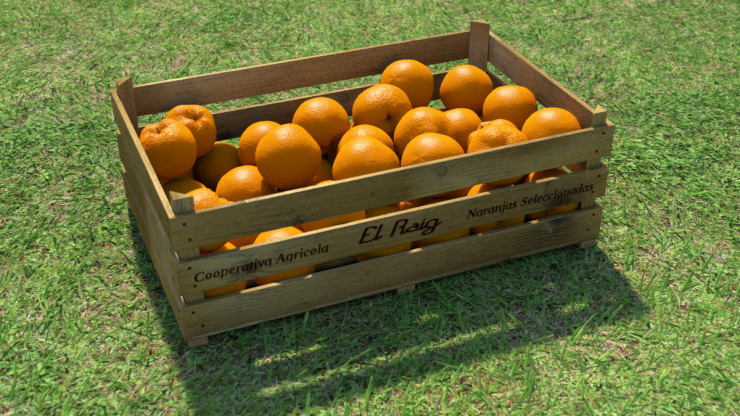 The oranges are my old isosurface oranges (isoranges for short), and the wooden box was again quickly modelled with the irreplaceable Wings3D. 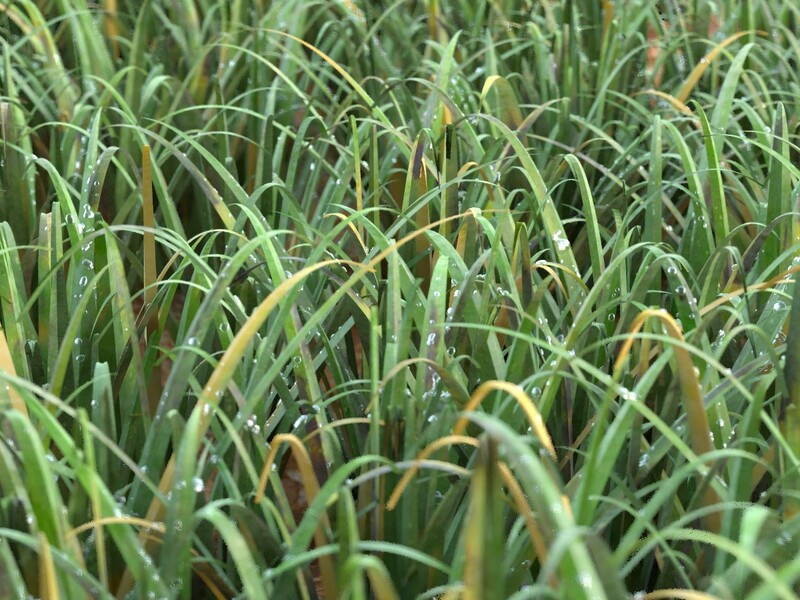 The ground is a grass picture from mayang.com, but it looked too flat, so I added some thousands of mesh grass blades on top of it, using the same image to texture them. 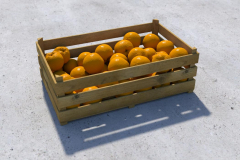 As soon as I modelled the box, I used Koppi’s Bullet Physics Playground to set-up a “dummy” scene replicating the geometry of the box and 4 different sizes of oranges (just boxes and spheres). I ran the simulation for 48 randomly chose oranges, and then customised the exported SDL code to substitute the objects with the final ones. 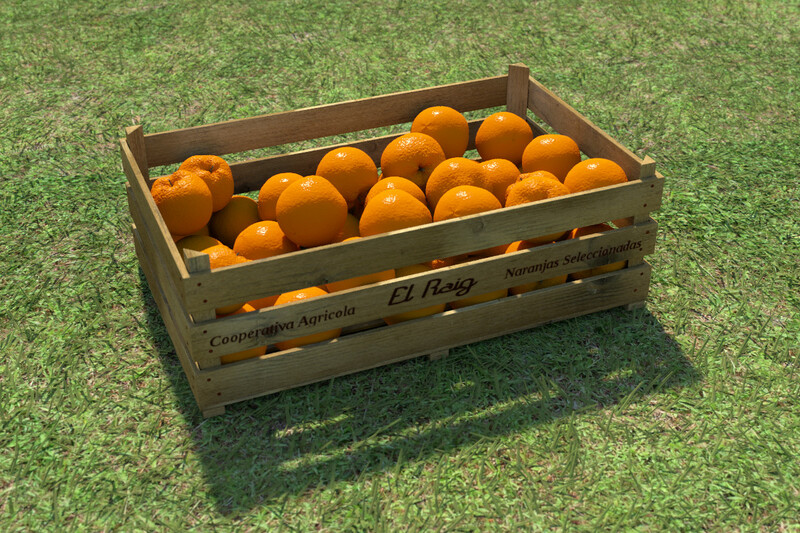 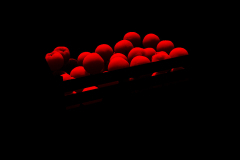 Then, after the 2h render, I noticed the oranges looked way too artificial without SSLT… So, I rendered in 13m an additional image with subsurface on the oranges and everything else in black, then screened this image on top of the original render at 50% opacity. It’s not like the real thing (that is, using SSLT directly on the same render), but looks good enough for the time invested.